"Shoot Now, Focus Later" Camera Released | OhGizmo! 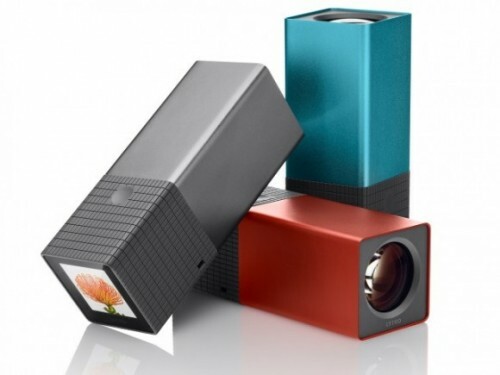 Seems like everyone is excited about the Lytro, a “light field” camera that was released yesterday. And for good reason as it fundamentally shifts the way pictures are taken. Instead of having to focus on your subject, you simply frame your shot and take it. The Lytro captures “color, intensity, and vector direction of all the rays of light and then assembles that information in post-processing.” The picture below gives you a quick overview of the principle behind it. Once the data is processed, you can then access a “living picture” through software that seems to be available on the Mac only at the moment and lets you choose pretty much any focal point. Yes, after the picture is taken. We’ve embedded a few of these pictures at the end of the post; have fun clicking around and seeing the focus shift. Seeing as the technology is fundamentally different that traditional cameras, the company doesn’t speak of resolution in terms of pixels, but rather light rays; the Lytro can capture 11 million rays of light. Without delving into science speak, we’re a little confused by this particular terminology since our understanding of physics precludes the existence of a discrete “ray of light”. Instead, a particular point in space will bounce back a nearly infinite number of photons in all directions, some of which will fall on the sensor. But… no science speak! We simply think that “11 mega-rays” is marketing speak. The camera boots up almost instantaneously and has only one button: the shutter. It comes in 3 colors and 2 capacities: 8GB and 16GB, allowing for 350 or 750 pictures. Hit the jump for more of these pictures and links. “no science speak” – do you need science? Simple: take lenses, take black plate with 6 holes and put it in focusing point of the lenses, put 1 sensor (or 6 smaller sensors) behind plate, and here you go! You will get 6 images, shifted, and then just do software work on mergin those images together with different coefficients – this is how aperture grids do focusing. And the out put is not 11 mpx, it is actually 11 / 6 =~ 2 mpx. what is its max resolution? if you look inside lfp-file that camera saves, you would see that each image (of 6 images) has 1080×1080 pixels, so it is 1 Mpx actual resolution. You would think it would be easy for an iPhone 4s app to be coded that does the same thing since the iPhone can focus on any spot you touch so an app can just focus on multiple areas and snap multiple photos and stitch them in an app! I’m not sure that would work. You’d end up with 1) a picture with everything in focus all at once, or 2) multiple pictures at different focal lengths but not taken at the same time. The beauty here is that the Lytro takes only one picture. Well like Sergey pointed out…..within the lfp file that the camera creates (try downloading the lfp files from the above samples) adobe flash parses the images and allows the user to click on a region of the image and that focused image is displayed. Since there are multiple images that are 1 Megapixel inside the file it would only take an iPhone app that can take rapid photos in succession (like the QuickPix app) and can even reduce the quality to 5 Megapixels for a faster response and yet would still be better quality than what this camera offers and the app can then allow the user to chose what to focus on by taping on an area of the image and can even package all the necessary files zipped to allow the user to upload it to a website for online viewing. NO FLASH, IS THAT BECAUSE LIGHT FROM FLASH WOULD COME FROM ONLY ONE DIRECTION ?